Ubisoft's venture into the world of Mario took us all a little bit by surprise when it was finally unveiled at this year's E3. 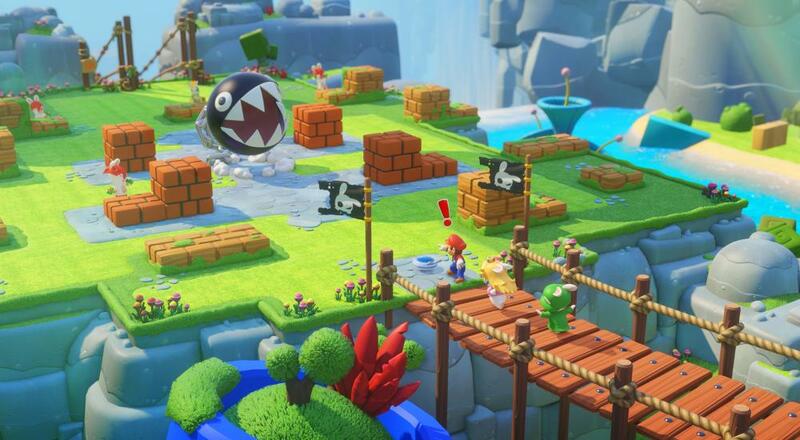 The rumors and leaks prior to the event had many wondering what Nintendo was thinking, but seeing Mario and Rabbids Kingdom Battle in action eased many of those anxieties. We only got a little tease of the co-op mode at that time, but now, a new gameplay video provides the pertinent details. The two player local co-op mode in Mario and Rabbids Kingdom Battle is completely separate from the single-player campaign. The devs describe it as a challenge mode where players choose a challenge, such as defeat a certain number of enemies within a set period of time, or make it to a certain objective point, and then each player chooses a team of two characters. Different characters have different special abilities, like Luigi being good at long-range shots or Rabbid Peach being able to heal teammates, and each player can also choose a weapon loadout for each character in their team. Players are also able to level up the abilities of each character. It's not specifically discussed in the video, but it seems that both the weapon loadout and ability upgrades are tied to the progression in the single-player campaign. While it's disappointing the campaign doesn't allow for a friend to hop in and play, it does sound like the devs put some work into making these co-op challenges. Mario + Rabbids Kingdom Battle is available on the Nintendo Switch on August 29, 2017. Page created in 0.9948 seconds.